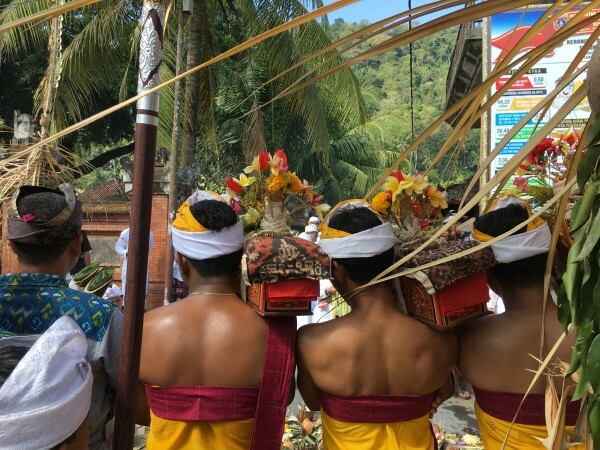 I have just come back from a wonderful trip to the Lesser Sunda Islands and Bali in Indonesia. This blog will be the start of a series that I’ll post this month that covers this trip. I’ll start at the last 3 days in Bali and then go back to the start. Why? Because there’s a lot of information to sort through and there’s much less on these last few days. Bettes, Larry, Libby and I had decided to culminate our trip with a few days here: a chance for 4 friends to spend time together before going our separate ways. I had carried out a lot of research on places to see weaving but a festival conspired against this. 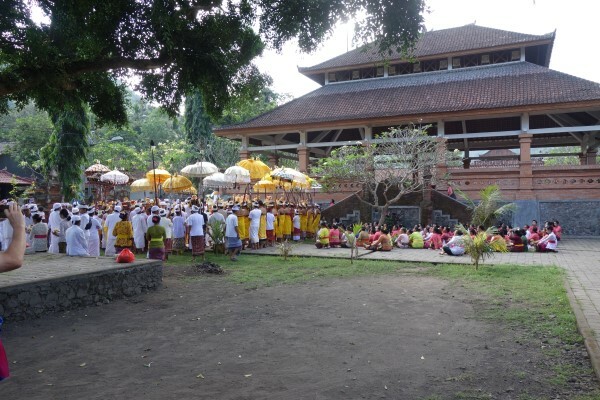 Galungan according to a Google search (https://www.balitravelhub.com/events/galungan/) is one of the most important Balinese festivals, is the culmination of celebrations held in honour of the creator and ancestral spirits. At the core of the festival is the celebration of good and the overcoming of evil; the victory of Dharma and the defeat of Adharma. 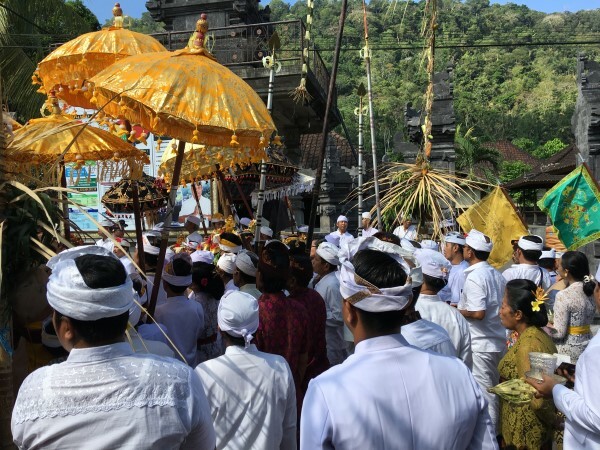 The festival usually runs for around 10 days at various locations around Bali. 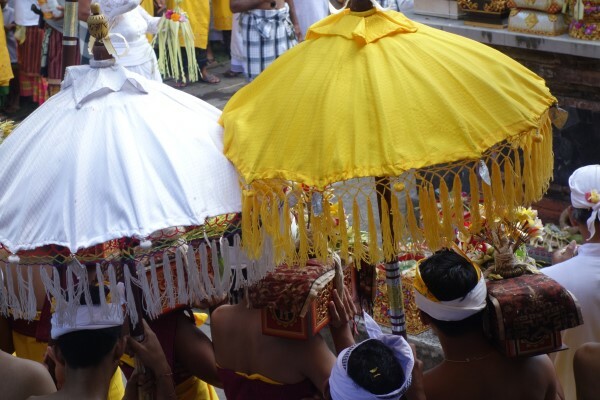 Because the Balinese calendar does not align with the western one, it is held at a different time each year. We were unaware that we’d experience the first 3 days of it. However it proved to be a not to be missed experience. These street banners or perjor were everywhere. Some were much more intricate than others. These are made only by men. At the end of the festival, we’ve been told that they will be ceremonially burnt. We were also told that these were for the rice goddess. However our visit did mean that many of the places of interest on my list were closed or operating on a basic level. Weaving places may be open but there would be no weavers. These galleries were open and were well worth a visit. Kuluk Gallery, Ubud. Email kulukgallery@gmail.com. This gallery has amazing antiques including textiles. Donna Lunn has a wealth of information. Neka Art Museum, Ubud. The focus is listed as fine art. There is also an impressive collection of superbly decorated keris, or ceremonial dagger. We saw these daggers being used in a ceremony. www.museumneka.com. 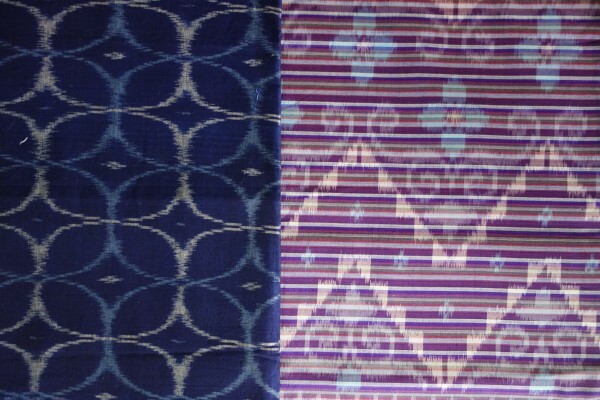 We stumbled across Manik Bali, Ubud and found beautiful cotton yardage both plain and ikat. It’s great to see and feel beautiful hand woven (even if it is commercial) fabrics. There’s even an opportunity to have garments custom made. www.manikbaliikat.com. 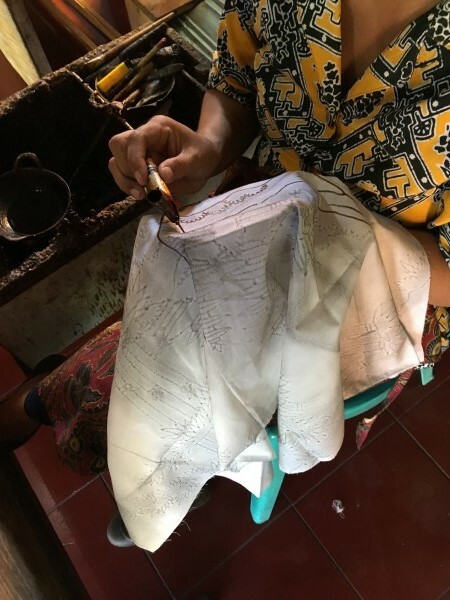 Our driver took us to a batik workshop and retail outlet because it was one of the few places open on an afternoon where we had little success with finding weaving. 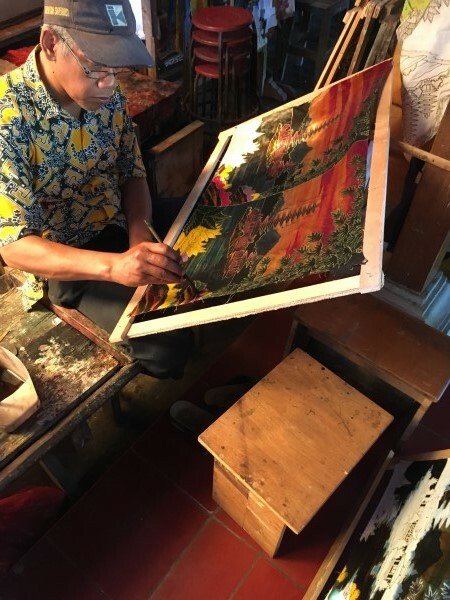 Batik is common in Bali though it is not a traditional skill. The results are very touristy. However the process was being demonstrated. Here the designs are drawn in bees’ wax using a tjanting, a tool that controls melted wax flow and draws a fine line. The wax will stop dye penetration. Areas will then be coloured in using dye. Sometimes areas will be covered with another application of wax to resist the next application of dye. Finally the wax will be removed by boiling. We did drive through beautiful picture book scenery to Sideman. 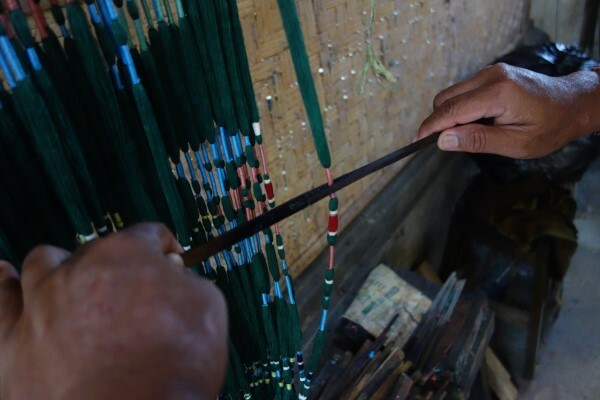 Sideman is a well-known destination for endek (weft shibori) and songket (brocade). There are several weaving outlets there. We visited Pertenunan Pelangi. Unfortunately there were no weavers, though there was a man wrapping ikat at a most amazing pace. Binding the warp stops dye penetration. Each colour binding indicates a different colour. 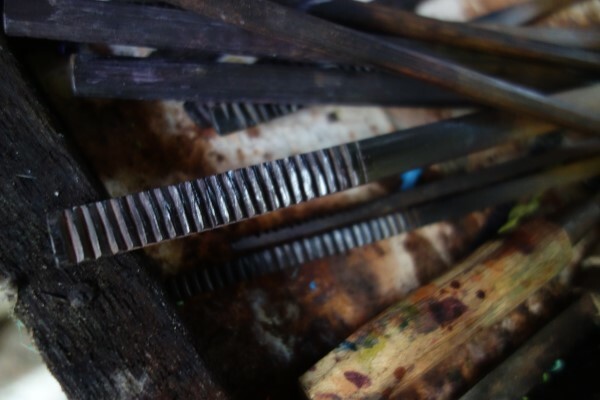 We saw where dyeing was carried out and Eka, our driver who is very familiar with this destination showed us how two of these wooden tools were used to apply the dye and work it into the tied spaces after the background colour was applied. They are dipped in the dye and the bound sections rolled between two of these wooden paddles. Here’s a close up view of the inside surface of the tool. These ridges force open the warp and pushes in the dye. This is the space with all the looms. They were all 2 shaft for the weaving of endek which only requires plain weave. A couple of endek fabrics. These have a very contemporary feel. I found the stripped fabric in combination with endek quite interesting. After Sideman we drove towards Tenganan, the village renowned for double ikat. We had all heard that it was questionable as an experience as it is very touristy. However it is double ikat so we thought that we should go. Our decision proved to be a highlight of our stay in Bali. We encountered a street parade close to our destination. It was part of the Galungan ritual. We walked behind it as it progressed up the street watching each stage as it stopped for significant ceremonies. 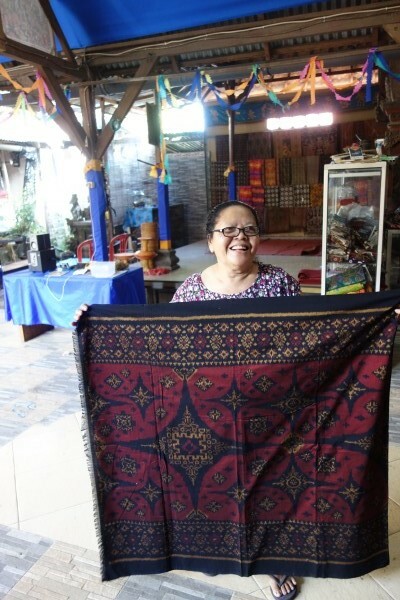 As well as being an extraordinary experience, we were excited to see the sacred double ikat cloths being used. Here is some of what we experienced. The procession up the street. A close up view of the double ikat being used as sacred cloth underneath caskets which we were told carried relics. We were very excited to see fabric being used with such significance. 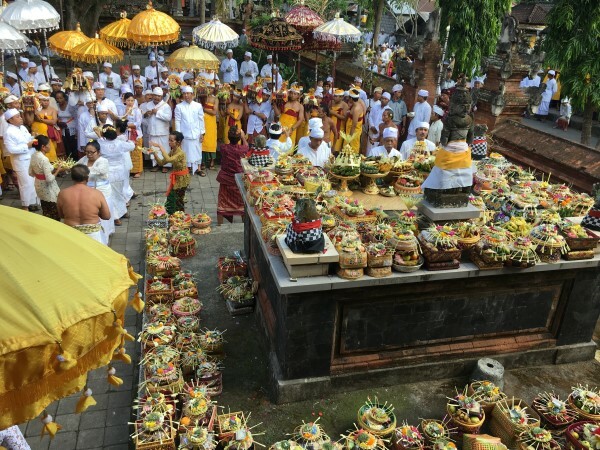 Images of the ceremony at the culmination of the procession with the blessing of the food. 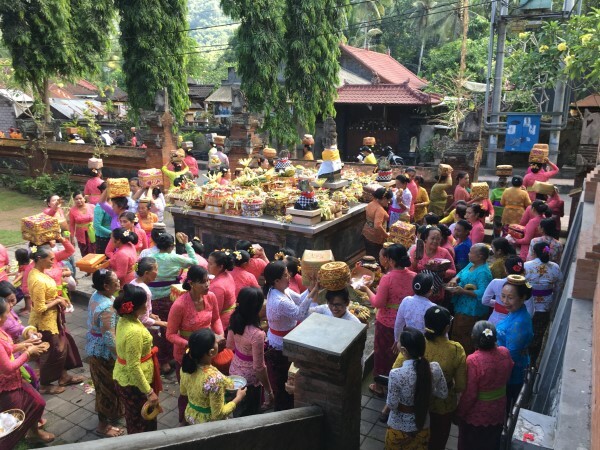 Women waited behind the main ceremony to collect the blessed food. It was pretty special to see this aspect of textiles: cloth used in ritual. Note also that for this celebration, the men are all dressed in white while the women are dressed beautifully in formal dress. 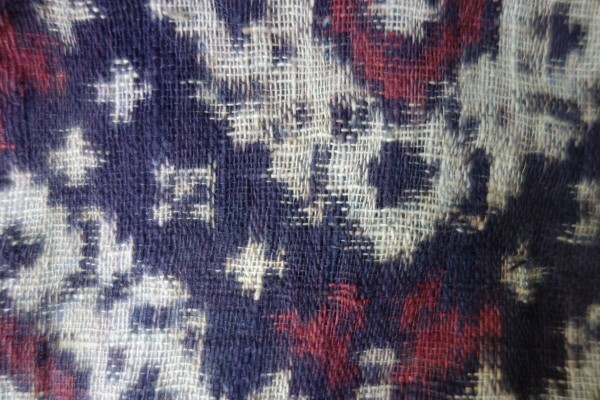 Here’s a closer look at a similar Tenganan double ikat from my collection from 2007. Note the uncut circular warp. 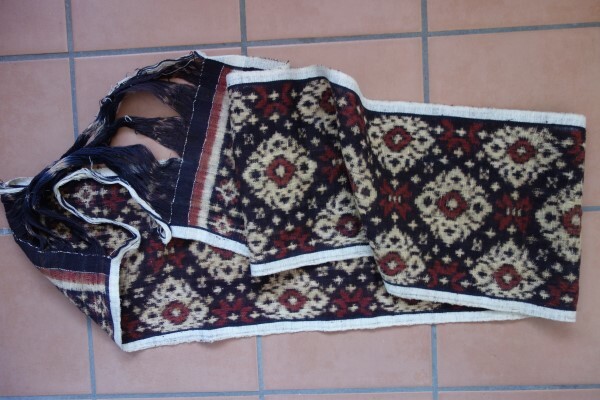 This is used to indicate that it is a new cloth and one that could be used in rituals (festivals, births, deaths etc). This detail shows a close up look at where the weft and warp intersect. The warp and weft are wound separately, tied and then dyed. There are two dye baths required in this example. Dyes are indigo and morinda. The warp is then put on the loom and woven with the dyed weft. It takes great skill to achieve both coinciding at the same place to achieve imagery. You can see feathering at the motif edges where some dyed/undyed warp or weft extend past the pattern areas. After the ceremonies were over, we did continued up the hill to Tenganan. It looked as though it was the same village but is apparently it is three all joined together. Yes, it is one of those villages set up to make the most of the tourist trade but we did find several outlets with weaving. We went into one of these shops and saw the double ikat. 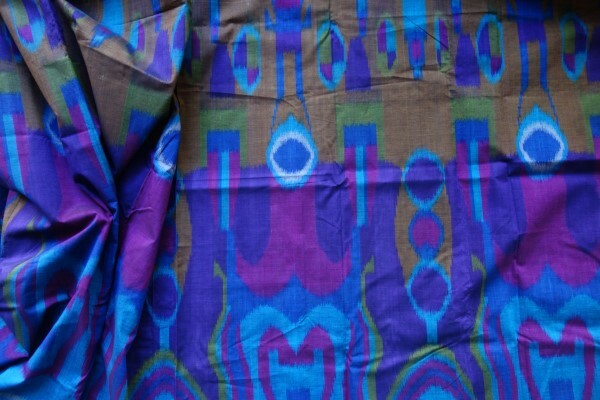 But we also found some single ikat in cotton including this one which is woven in a similar style. This woman told us that her daughter started weaving double ikat at 12. That’s wonderful news to hear that there are young women learning this technique and very impressive to those of us who weave that someone this age is doing so. 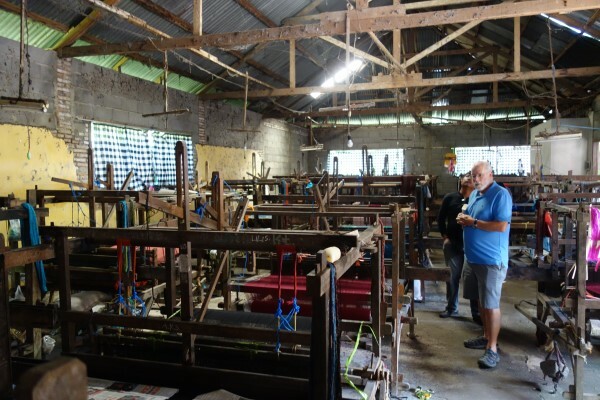 It appears that weaving and textile production in Bali is done on a very commercial level aimed at production with often a focus on tourism. 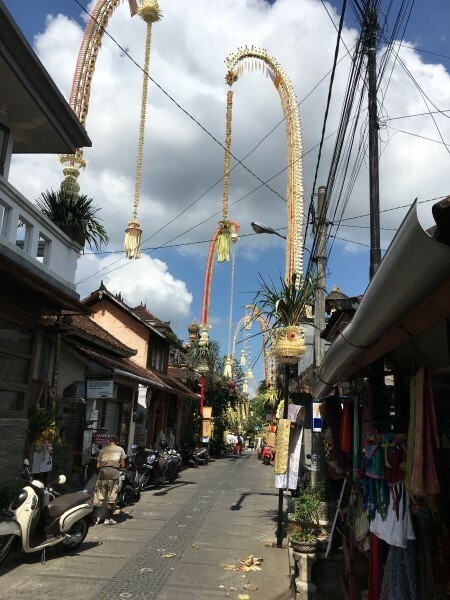 This was especially noticeable in the contrast to what we had just experienced on our tour prior to Bali. And what an experience that was as you’ll see in Part II of this month’s blog. Often I don’t make mention of where I stay but in this case it was extraordinary. 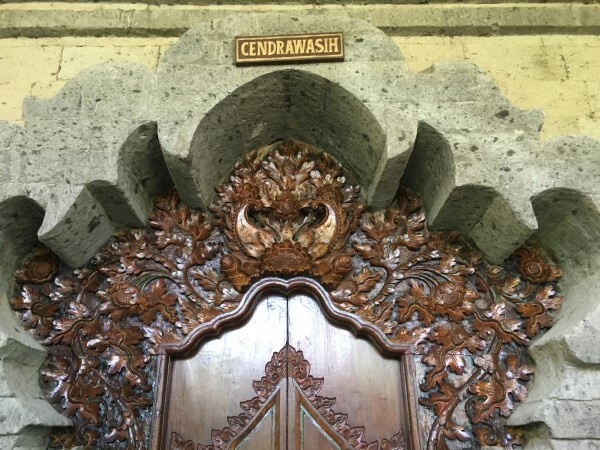 The accommodation was palatial and very Balinese. The staff extremely friendly and helpful while the surrounding area was tranquil in spite of being relatively accessible to places of interest. I’d highly recommend it. http://www.alamindahbali.com This is the carving at the top of the entrance to our space. You are currently browsing the archives for the Double ikat category.